Were Rama and Sita trying to set a perfect example of how a married couple should live, according to the Vedic code? When I first set foot in Ayodhya it felt like going back in time, treading along dusty streets in the footsteps of the citizens and the court of King Dasharatha. In my mind’s eye, I saw the splendour narrated in the opening verses of the Ramayana, here is the playground of young Ramachandra and Lakshmana; an organised city shaded by Sal trees with palaces and houses built of the same. For years I have plunged in and out of some of the multitude of Hindu Deities because I believe all prayers lead to God and the spiritual energy in the universe is available for everyone to interpret. But Ayodhya is no longer the fair and mighty Royal city as described in the Ramayana, with mines of gems and perfect fields of wheat. Ayodhya is the most important back of beyond in India, development jumped over Ayodhya as the cow jumped over the moon. Ayodhya still has a beautiful aura, there are an infinite number of well-tended shrines to Rama, Hanuman, Ganesha; here is Hinduism in action, living breathing spirituality but still one feels the weight of the past, there is a sense of ages of homeless souls waiting for stones to soak into for eternity and peace. 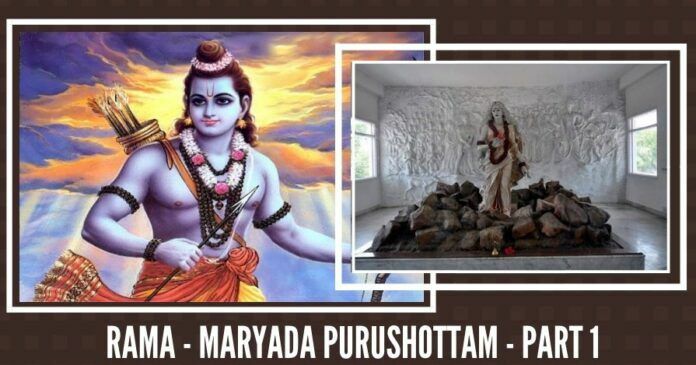 I yearned to visit Ramkot the birthplace of Rama, but the endurance test for less than thirty seconds of devotion brought to mind hopes that a proper temple for the man-God, who has captured the hearts and minds of Indians to this day becomes a reality. The stones that will bring the right to worship lie stacked and waiting at the edge of town. The Ayodhya of 2016 still rang with chants and chimes echoing its glorious past but there is little comfort for the pilgrim. To worship Vishnu’s mortal incarnation, one has to be prepared for frisking and then to walk the caged kilometre to stand too briefly before the tent-temple and idol within. For the devotee this is a hurried experience because of the pressure to move on, every day literally thousands want to worship the Perfect Man; the procession that passes the tent is orderly and emotional, the emotion is diluted by the urgency to exit and by the presence of the guards. The army of Hanuman/Langur monkeys at least lends some authenticity to the experience. Nevertheless, some come 2/3 times a day and others from far and wide to pledge their devotion. Before I go any further I must explain that I have been travelling to and from India for over thirty-five years; I do not claim to be any sort of expert about faith, Hinduism or India or anything else, only an admirer of Indian traditions and of the Indian mind. If any innocent mistakes are made along the way I sincerely regret any offence inadvertently caused. For years I have plunged in and out of some of the multitude of Hindu Deities because I believe all prayers lead to God and the spiritual energy in the universe is available for everyone to interpret. I cannot remember what attracted me to Lord Rama before I became obsessed. Perhaps I measured mortal men’s imperfections next to Rama who intuitively knew the consequences of everything and thus the right thing to do; or it may have been the imagined love poems by contemporary poets from Radha to Krishna and from Sita to Rama, both are achingly beautiful love stories. Early in 2013, it may have been the controversy relating to the Ram Temple that made me re-discover the Ramayana. I have read a few of the lyrical retellings and interpretations of the Ramayana but I love the simple and succinct retellings for children most. Rama, fairer than the sun and moon Mr Physical Perfection, born to save the sons and daughters of India from Ravana, and a fate worse than death. I just keep thinking of this man-God with his wise wife and loyal brother who still inspire people today with their exemplary Dharma. I admire their purity and discipline to do the honourable thing, which makes the past so vivid and relevant today. I tried discussing this concept with my Western friends but they were oblivious to the literature, only in India with my Indian friends did I find traction with the conversation. The fusion of devotion, ethics, respect, good versus evil, truth versus untruth, understanding of human chicanery, courage and leadership make for a compelling philosophy but with the addition of love, as an incurable romantic, I am glued to the story. But not all love stories have happy endings, many results in tragedy but that does not make them less of a love story. In 2013, I wanted to retrace Rama’s journey across India in a documentary film about Sita’s faith that Rama would rescue her. I did a lot of research and am still attached to the concept. At first take the idea was welcomed but as it turned out nobody wanted to trust a white woman with the cash to tell an Indian story. I understand the scepticism and hope one day I will deserve that trust. While I was testing the idea for the Perfect Man documentary I discovered grumpy people who were opposed to Rama for “abandoning” Sita, but as I understand it Rama and Sita were trying to set a perfect example according to the Vedic code. After all their experiences of survival together and their faith in being reunited, I imagine their love was more mature; as a result of the happiness and hardships in the forest or Sita’s captivity, they shared a heartfelt understanding of each other, two facets of one ideology with their minds and emotions attuned. This final separation must have been almost unbearable for both of them, Rama chose a virtuous path and respect from his people over his unquestionable love for Sita. He did his duty as King and the son of his father, he chose to serve the people of the Kingdom and Sitadutifully followed his wish, both behaved with dignity, despite personal suffering. To do what does not come easily can only be done out of love. What a perfect exemplar of humanity. Radha also suffered when apart from Krishna, so there is this theme of extra-ordinary loving begetting the suffering of separation and the endurance thereof for the greater good. When you love a God your duty of love is to be accepting and forgiving for the greater good of humanity, the love is the reward – even if it makes you miserable. After all, Rama was only enacting the prophecy, made to Dasaratha by Durvasa, that for Vishnu’s sin of anger and his slaying of Bhigru’s wife, that he (Vishnu) would be born again as a mortal man and be separated from his wife, enduring the same pain of separation as Bhigru. Hence the blessing to Dasaratha of having a son-God (sun-God), was also a curse on Rama for the sin of Vishnu. Rama was wholly benevolent and continuously worked for the welfare of mankind; he must have missed Sita during his every living minute, carrying a golden image of her with him at all times. After Sita returned to Mother Earth, Rama was inconsolable and performed ten thousand rituals as acts of atonement. The notion of Karma and their eventual reunion and eternal Ananda in Swarga can console us all. Even I doubted the name (white woman especially Christian, whom I don’t trust will respect Indian epics), but you showed the love for Rama with your writings. Rama is an ideal person whom any woman would love to have for her husband. Maturity, trust and love for his wife (to cross sea and fight against an established king in his own place), the decision he took to prove his wife’s purity to others and not in suspicion… Finally sacrifice his wife n personal happiness for the sake of his countrymen…. He is a perfect MAN…. India will be a heaven on earth if every house had a Rama follower. Education system should ensure kids are taught about the great qualities of Rama to have better citizens for future. If not for petty politics, he could be made an icon of India. Kerala filmfest: Movies that connect with heart and mind.